Another MEGA Bloks review, and a look at another of the company's licenses; this time Terminator Genysis. Although a small line designed to support the release of last year's blockbuster movie, MEGA's range of sets and figures are still worth a look, and we've decided to start from the very ground up. 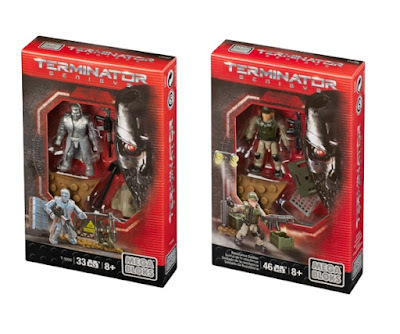 The smallest sets, those of the Resistance Soldier and T-1000, will set you back around £5 each and contain less than 50 parts. Let's have a look, shall we? Each set includes one of the new (or rather post-2014) highly-articulated figures, a host of accessories for said figure, and a nice bit of terrain to use either as a stand or to join together to build larger things. The T-1000 on the lft comes with just 33 pieces, while the Resistance Soldier on the right boasts 46. Each set comes with a small fold-out instruction booklet and will take no more than a couple of minutes to assemble. First up, the human character. The Resistance Soldier looks very much like a figure from a Call of Duty set at first inspection, albeit with a futuristic plasma rifle weapon. 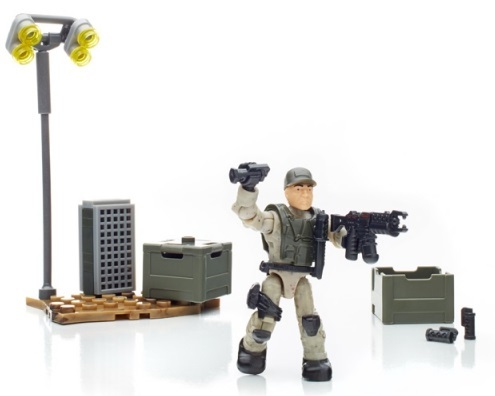 He has the basic core body of one of the micro action figures (which we reviewed in greater detail here), and comes with a utility vest, thigh band, knife, and a tonne of grenades. The speckling on the uniform is very nice, adding to the post-apocalyptic grubbiness. There is a peg hole in the back, although this figure doesn't come with backpack. That said, he is completely compatible with all the Halo and Call of Duty accessories, so if you really wanted to tool this fella up, you could. The Resistance Soldier's terrain section is a simple yet interesting affair. Included is a small terrain base plate, two crates (one with a lid for all those grenades), a light, and what can only be described as an air conditioning unit. Perhaps it's pretty warm in the future after the machines have taken over? Still, a good number of usable parts and plenty of room for the figure to stand. The T-1000 figure has a similar base body part, but here rendered entirely in silver. He has a rubbery tail-coat section that attaches at the waist, and a hard plastic top that slots over just like the Soldier's vest. To be honest we don't think this works very well, as even in these photos you can see that the rubber and plastic elements don't really match, spoiling the liquid metal aesthetic. Same story on the back with the peg-hole, and also the continuation of those tails. From the rear it actually looks a little more convincing as the lines are smoother and there is less detail for your brain try to match up. Mr 1000's (we assume the 'T' stands for Tony) terrain is even more basic than the other set's, using larger single bricks such as a speckled grey rock. There is also a printed barrier part, four barrels, and some tools which can be wielded by any figure. The base plate is the same with the Resistance Soldier, so there is plenty of room to stand your figure. The MEGA Bloks Terminator Genisys Figure Packs are a great way to get your hands on nice figures and useful parts, at great low prices. If you're looking to build an army set in this world then you could do worse then getting several duplicates of these, and the combined terrain would look awesome. Even if you're a MEGA Bloks collector and not really into the Terminator franchise, there is still plenty of value here.